Did you know that, technically, you can charge your EV charger in the same regular old plug you can charge your phone in? You can also, technically, use a key and a kite to try and charge the car too, but we bet it would be about as effective as using mayonnaise for makeup. Instead, we recommend getting a real life, bonafide EV car charger installed. You see, charging your electric vehicle with the same plug you use to power your kid’s razor scooter is called “Level 1” charging and it’s exactly as ineffective as it sounds. In fact, Level 1 charging your EV can take anywhere from 8 hours to 24. The better option is to just bump up your power by one level to a Level 2 charging station inside your home. That’s where Divine Electric comes in. We know that purchasing an electric vehicle was a strange purchasing experience. Before you invested in your Tesla or other electric vehicle, you had almost no idea what to look for in the vehicle of that kind. But you caught onto the industry standard terms and what you should expect in a high-quality model vehicle, and you’ll catch onto the details of this one last hurdle quite easily. If you’re wondering what sort of Level 2 charger you should look into so you can start charging your vehicle in a time effective fashion, we’re here to guide you through the process. Just like when you travel to Europe or a different country, there’s probably going to be something weird with the plug you need on this car. In this case, though, that’s indicative of needing a different power source for your car, it’s not simply a matter of preference. To start, your electrical charging unit should have access to at least 30 amps of power, most importantly it needs to be connected to a circuit breaker that can handle at least 40 amps. This should only be enough to allow 30 miles of range per hour though. Many folks get caught in the “it’s cheaper now” trap and opt for a 15 amps charger which is not a good long term decision. The future is headed in the direction of more EVs on the road and manufacturers are actively turning out better ranges on every new model. So 15 amps really will barely cut it for your current EV, let alone the one you eventually trade up to. When you’re buying a phone charger, you’re likely going to be cautioned against the 10-foot long one because it harms the battery, but that’s not the case with your EV. We’d go so far as to say longer is better in this respect. Most charges come with around 15 feet of cord, but if that’s not going to be enough to reach your spot in the garage, upgrade and get the full 25-foot cord. These are often easily outfitted to the portable EV chargers. You can have a 240-volt receptacle installed into your home and opt for a portable charger that will allow you to tug it around with you to wherever you can find that level of plug so you can juice up your vehicle on the go. One of the more powerful buying options now available is the smart EV charger. That means you can get home, plug in the car and pause when the vehicle starts to charge. If your area charges more money for electricity used between 4 pm and 8 pm, then you can control when the charge kicks in from your smartphone. Some chargers even communicate with the power company on their own and only charge at off-peak times and a few can act on commands from your Alexa assistant. If you use the car for business, you can use a smart EV home charger to track exactly how much you’re spending on electricity for the vehicle which makes it super easy to write those expenses off in your taxes down the road. 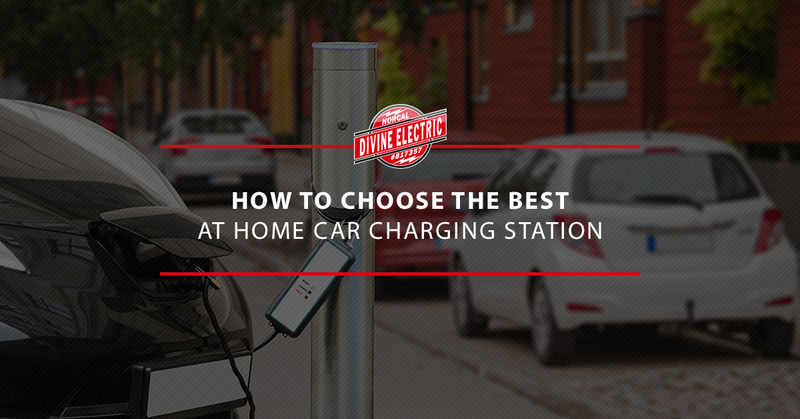 Divine Electric specializes in EV home car charging installation and can help you pick the right unit for you. Reach out to us to schedule your consultation today.